Polhemus has been working with prime contractors and military entities since 1969. 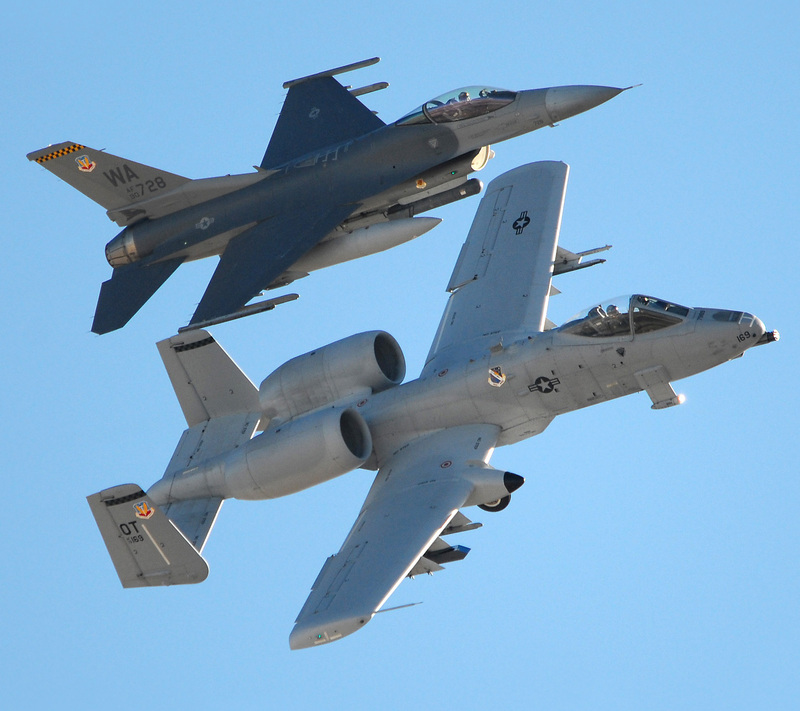 Our systems have flown on U.S. Air Force, Navy, and Army fixed and rotary wing aircraft including: F-4, F-14, F-15, F-16, F-18, F-101, UH-60, MH-60, AH-1, AV-8B, MH-53, Comanche, AT-6, A-10 and C-130. Available for F-22 and F-35 consideration, please contact Polhemus for a more complete resume of aircraft and simulator experiences. Many other customers require the absolute best top gun helmet tracker performance with the low risk, solid-state, progressive technology for which Polhemus is known. Thales Visionix (the fielded tracker for Scorpion HMCS), Raytheon, Lockheed Martin, NAVAIR, and Rockwell Collins are just a few who have selected Polhemus for the best in head tracking. Currently fielded on active A-10, F-16 and C-130 combat aircraft, our very best precision helmet tracker, SCOUT™, offers the highly acclaimed accuracy and performance trusted for over 40 years by the U.S. Government. See the video on HMIT, where Polhemus SCOUT tracking technology is used by top pilots. As the pioneer of AC electromagnetic tracking technology, Polhemus has received numerous landmark patents which continue to define state-of-the-art products. Polhemus has been continuously involved in the design and development of tracking technology as applied to helmet-mounted cueing systems and head tracking. Through focused IRAD efforts, Polhemus continues to raise the bar with advancements in electromagnetic physics, computational algorithms, digital signal processing and mechanical techniques. The results continue to set new standards in tracking accuracy and ease of system integration. Always moving forward with next generation innovations, our high precision trackers have been installed in simulators of most airframe manufactures and in laboratories such as Wright Patterson AFB, NAWC, NAVAIR, Fort Rucker, NASA and DARPA. Additional installations have occurred at Fort Sill, Fort Irwin and AATC. Polhemus technology can be employed in ground vehicles, fixed wing, rotary wing, high fidelity training simulators, human-wearable 3D input devices, and cost effective desktop trainers. At Polhemus, we take pride in the work we do with government and military forces. Polhemus pioneered the original electromagnetic head tracking in the late 1960’s and has advanced the technology in tracking excellence ever since. Today’s magnetic tracking systems are nothing like those of the past – they are the absolute best trackers available and offer the clear advantage over emerging hybrid technologies which attempt to blend outputs more than one singularly limited tracking reference to compile a synthetic position and orientation solution. Polhemus magnetic innovations are light-years ahead of even the best optical inertial hybrid trackers. We are proud to offer our customers the low risk, high accuracy, fully day/night compatible helmet tracking solution with large head box coverage, minimal cockpit mounted equipment, no line-of-sight limitations and an ultra small, lightweight and embeddable helmet sensor. Polhemus has received many awards and accolades for our products, and we are proud to have received the prestigious Innovation Award within the Top Training and Simulation Companies selected by Military Training Technology magazine in 2008, 2009 and 2012. The list of top training and simulation companies is selected from the very best around the world. Polhemus' latest head/helmet tracker, SCOUT, offers unprecedented ease of integration, accuracy, and simplicity for both real and simulated aircraft cockpits and ground vehicles. Fielded and flying on A-10, F-16 and C-130 aircraft, the SCOUT is our very best. Available for flying rotary and fixed wing aircraft AND flight simulators; our intent is to offer customers the edge in lightweight wearable motion tracking technology where requirements may involve tracking a pilot’s head for accurate weapons cueing and control; slewing a gimbaled sensor pod on the latest ground or air based vehicle; cueing a remote weapons station on a drone; and countless other scenarios involving advantages with simple and real-world man/machine interfacing. Whether it be simulated training or real-world fighting vehicles, Polhemus can provide the accurate tracking sensor for success. Soldiers in training wear Polhemus 6 Degree-of-Freedom tetherless motion trackers as a natural human behavior input device to the simulated scenario. 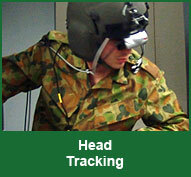 For example, a small and lightweight tracker is worn on the head to track line-of-sight and head position or worn on the body to track body position and posture. 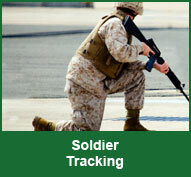 High precision embeddable track sensors provide the technical position and orientation inputs the training system needs to determine which way and in which direction simulated military equipment is being aimed and used. Add a sensor to the soldier and track heading and if body posture (standing, crawling, crouching; or moving left, right, forward or back). The effect is the soldier trains more naturally and with realistic freedom of movement – eliminating negative training caused by button pressing and joystick controllers within some training simulations. Used by the United States Air Force for pilot training, VisionTrak™ is the standard in eye tracking excellence and the leader in versatility. Polhemus works with ISCAN, Inc., of Burlington, Massachusetts, to offer two primary platforms that are custom configurable to meet specialized requirements. Both platforms: the lightweight, head-mounted, version and the completely non-contact desktop remote eye-tracker are proven components to training, simulation, and real-world studies. 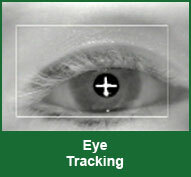 VisionTrak standard software is user friendly and powerful. Enhanced capabilities and features can also be utilized with optional software modules designed to simplify analytical tasks without limiting access to all of the raw data you may want. Point-of-regard analysis, raw point-of-regard data, areas of eye(s) fixation, fixation times, blink rate, scan path, pupil size, head and eye vector tracking, and much more can all be obtained with VisionTrak and available options. Below is a sample of case studies relevant to the military market. A single LIBERTY LATUS can track an area as large as 6400 sq. ft. (an 80 X 80 foot space).